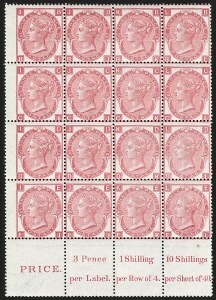 VERY FINE BLOCK OF THE 2-1/2-PENCE ROSE MAUVE FROM PLATE 10 -- INFREQUENTLY FOUND IN MULTIPLES OF THIS SIZE. Multiples of any size are quite scarce. In order to feed collector demand, most large pieces such as this have been broken down into blocks of four. Ex Baillie. SG as four blocks of four £14,000. 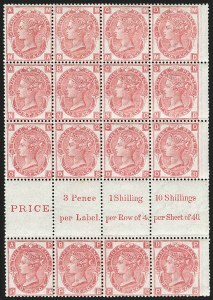 FINE AND RARE BLOCK OF THE 2-1/2-PENCE ROSY MAUVE FROM THE SCARCE PLATE 17. PARTICULARLY RARE AS A MULTIPLE. 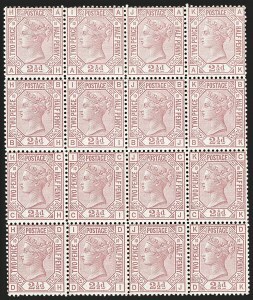 Only 5,000 sheets were printed from Plate 17 in Rosy Mauve. 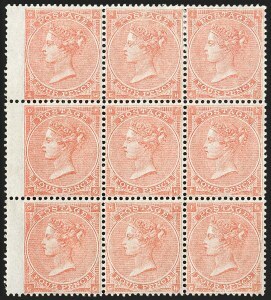 As a comparison to rarity, about 30,000 sheets were printed of the 2-1/2p Blue (SG 142) from Plate 17 just months after the Rosy Mauve. VERY FINE. 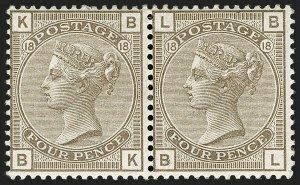 AN IMPORTANT AND RARE POSITION PIECE OF THE 3-PENCE ROSE FROM PLATE 6 WITH INTERPANNEAU GUTTER SELVAGE. RARELY ENCOUNTERED IN THIS FORMAT. Ex Baillie. 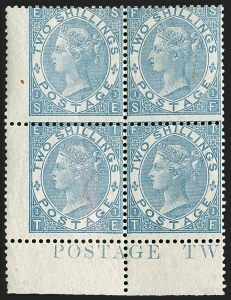 SG value as four blocks of four with no premium for the interpanneau gutter £13,600. VERY FINE. 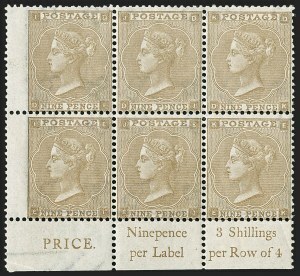 AN IMPRESSIVE CURRENT NUMBER MULTIPLE OF THE 3-PENCE ROSE FROM PLATE 7. A RARE SURFACE PRINTED BLOCK IN THIS SIZE. Ex Baillie. 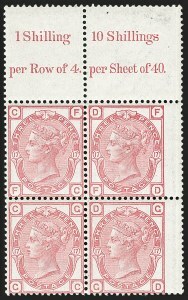 SG simply as four blocks of four and three singles £16,350. VERY FINE. A STRIKING POSITION BLOCK OF THE 3-PENCE ROSE FROM THE SCARCER PLATE 10. SELDOM ENCOUNTERED IN A MULTIPLE OF THIS SIZE. Ex Baillie. SG as four blocks of four £22,000. VERY FINE. 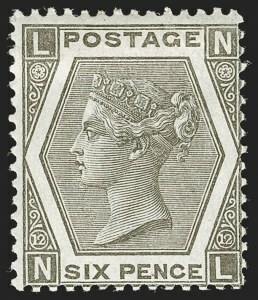 A HANDSOME NEVER-HINGED INTERPANNEAU GUTTER BLOCK OF THE 3-PENCE ROSE FROM PLATE 17. Ex Baillie. With 1997 B.P.A. certificate as a block of eight from which this came. SG as hinged with no premium for interpanneau gutter selvage £3,000. 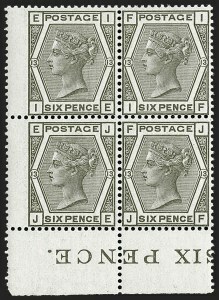 FINE-VERY FINE BLOCK OF SIX OF THE 3-PENCE ROSE FROM PLATE 18. Ex Baillie. With 1979 R.P.S. certificate. 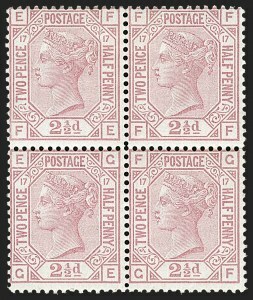 SG as block of four and two singles £4,000. 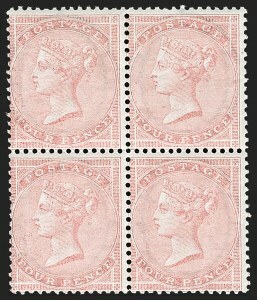 FINE ORIGINAL-GUM BLOCK OF THE 4-PENCE ROSE ON WHITE PAPER. PARTICULARLY RARE IN A MULTIPLE. Ex Latto and Baillie. SG £12,000. 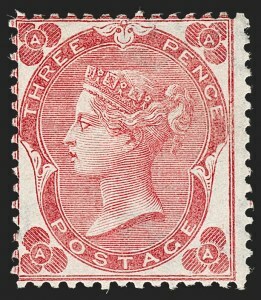 VERY FINE AND EYE-APPEALING LARGE MULTIPLE OF THE 4-PENCE IN THE PALE RED SHADE FROM PLATE 4. A SURFACE PRINTED RARITY IN A MULTIPLE OF THIS SIZE. Ex Baillie. SG as block and five singles £20,500. 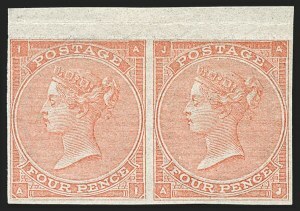 VERY FINE AND SELDOM ENCOUNTERED IMPERFORATE PAIR OF THE 1863 4-PENCE PALE RED FROM PLATE 4. Imprimaturs from this plate can be distinguished by either the lettering and/or the color shade. Since some of the lettering overlaps, as is the case with this example, the shade is the key indicator of identification. Imprimaturs are in a much deeper shade of Red. Ex Baillie. SG as singles £7,400. FINE. 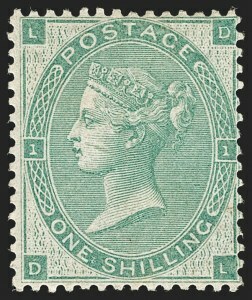 A RARE MULTIPLE OF THE 4-PENCE IN SAGE GREEN FROM PLATE 15, ESPECIALLY SO IN SUCH PRISTINE CONDITION. 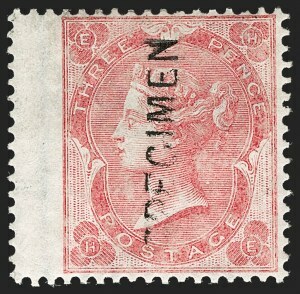 Plate 15 was originally used to print the 4p Vermilion beginning in 1875 before the change of color the following year. 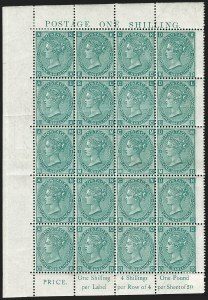 Due to the shorter span of life in printing the Sage Green, Plate 15 is slightly rarer than Plate 16. 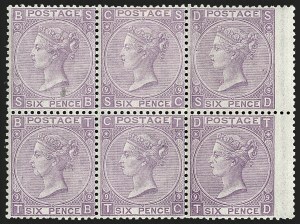 FINE POSITIONAL BLOCK OF THE 6-PENCE LILAC FROM PLATE 6, ESPECIALLY RARE AS A MULTIPLE OF ANY SIZE. 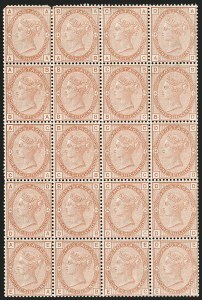 The rarity of a block is shown by the over 50% premium in catalogue value in the SG Specialised (four singles catalogue £7,200). Ex Harrison-Cripps and Baillie. With 1970 R.P.S. certificate mistakenly identifying this block as SG 97. SG £11,000. 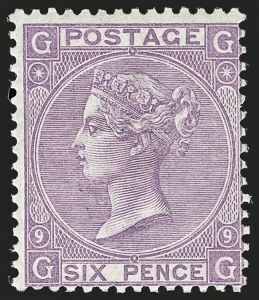 VERY FINE AND ATTRACTIVE MULTIPLE OF THE 6-PENCE MAUVE FROM PLATE 9. At a quick glance, there are a few spots on the reverse that appear thinned. The watermark was heavily impressed causing this appearance. Ex Baillie. SG as block and two singles £5,150. 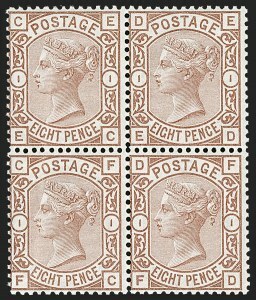 A FINE AND TRULY REMARKABLE COMPLETE PANE OF 20 OF THE 6-PENCE MAUVE FROM PLATE 9. A PHENOMENAL SHOWPIECE AS A COMPLETE PANE AND BELIEVED TO BE THE ONLY EXAMPLE IN EXISTENCE. FINE-VERY FINE. 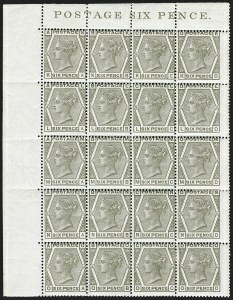 A TRULY REMARKABLE COMPLETE PANE OF 20 OF THE 6-PENCE FROM PLATE 16. A SURFACE PRINTED RARITY AND UNLIKELY MANY COMPLETE PANES STILL EXIST. 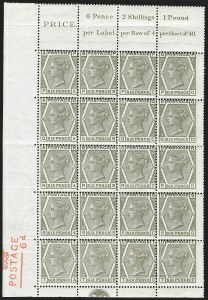 FINE EXAMPLE OF ANOTHER COMPLETE PANE OF 20 OF THE 6-PENCE FROM PLATE 16. A RARE SURFACE PRINTED PANE, SELDOM OFFERED. Despite the fact that the Bertsimas collection contains two panes, these multiples are by no measure common. It is unlikely that more than a couple others still exist. Ex Latto and Baillie. 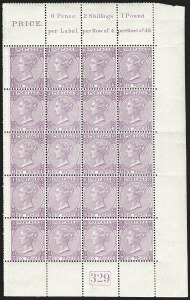 SG as four blocks of four and singles £14,000. 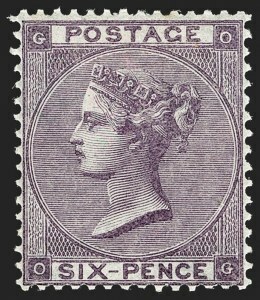 FINE AND SPECTACULAR BLOCK OF THE UNISSUED 8-PENCE IN PURPLE BROWN. THIS IS ONE OF THE LARGEST RECORDED MULTIPLES IN EXISTENCE. The 8p was originally issued to prepay the then-rate of postage to India via Marseilles and Australia via Brindisi. Despite the need for the value immediately, the printing was cancelled and issue postponed after 10,000 sheets were printed. The Purple Brown resembled the Rosy Mauve of the 2-1/2p too closely. All of the sheets were supposed to have been destroyed. 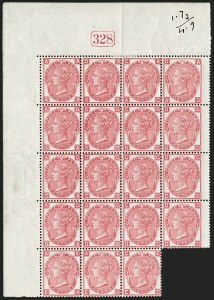 All known examples can be traced from their centering to the top left quarter of one sheet. Therefore, it is believed that no more than 60 exist in total. We are aware of only one larger multiple known, a bottom left corner selvage block of six (I-A to J-C) and one other that shares this size. Ex Latto and Baillie. With 2005 B.P.A. certificate. SG as hinged £50,000. VERY FINE AND EXCEPTIONALLY FRESH UNUSED BLOCK OF THE 8-PENCE ORANGE. RARE IN THIS PRISTINE CONDITION. Ex Baillie. With 1983 B.P.A. certificate. SG £9,750. 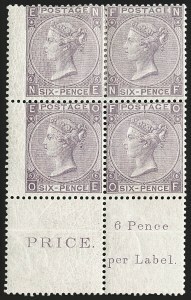 VERY FINE APPEARING MULTIPLE OF THIS RARE 9-PENCE BISTRE STAMP, EXPONENTIALLY SO AS AN UNUSED POSITION BLOCK OF SIX. AN IMPRESSIVE SURFACE-PRINTED RARITY AND STATED TO BE THE FINEST MULTIPLE IN EXISTENCE. Ex "Maximus" and Baillie. With 1984 B.P.A. certificate. SG as block of Straw shade (the Straw single is valued at £3,750 versus the Bistre at £5,250) and two singles £32,500. FINE. A SCARCE AND ATTRACTIVE MULTIPLE OF THE ONE-SHILLING FROM PLATE 4. Ex Baillie. SG as block and two singles £7,950. 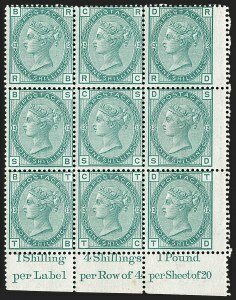 A VERY FINE AND SPECTACULAR COMPLETE PANE OF THE ONE-SHILLING IN THE SCARCE DEEP GREEN SHADE FROM PLATE 5. A SHOWPIECE COMPLETE PANE WHICH WE BELIEVE NO MORE THAN A FEW EXIST FROM ANY PLATE. Ex Latto and Baillie. 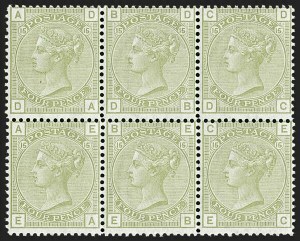 SG as four blocks (in the cheaper Green shade whereby singles are valued £200 cheaper) and four singles £24,000. 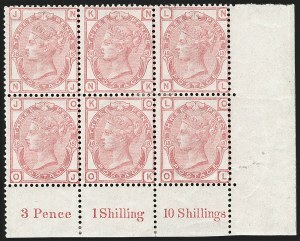 FINE-VERY FINE AND HANDSOME BLOCK OF NINE OF THE ONE-SHILLING FROM PLATE 13. 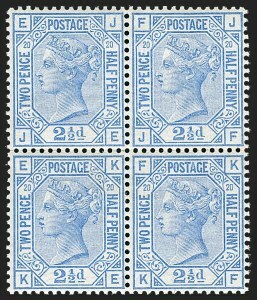 A RARE MULTIPLE OF THIS HIGH VALUE FROM THE SURFACE-PRINTED ISSUES. 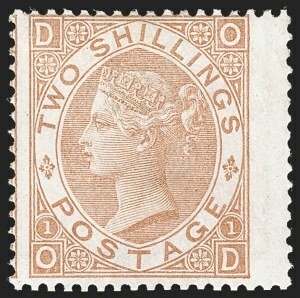 A VERY FINE AND EXTRAORDINARILY LARGE MULTIPLE OF THE ONE-SHILLING ORANGE BROWN FROM PLATE 14. THIS IS THOUGHT TO BE THE LARGEST MULTIPLE KNOWN IN PRIVATE HANDS. This block is equal to £1 of unused postage, a hefty sum at the time. When adjusting for inflation and purchasing power, this represents about £100 of unused postage left by the wayside. As evidenced by the increase in catalogue value between four singles and a block of four in SG Specialised -- £2,700 as singles and £4,000 as a block -- one can only imagine what the premium is for a multiple of this magnitude. There is one larger multiple known, a block of 20 (ex Phillips) that has since been institutionalized. Ex Latto and Baillie. SG as four blocks and four singles £18,700. 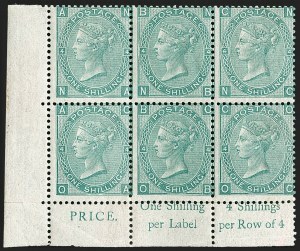 FINE AND IMMENSELY RARE UNUSED BLOCK OF THE 2-SHILLING DULL BLUE, PLATE 1. AN UNDER-APPRECIATED RARITY AS A MULTIPLE AND MISSING FROM EVEN THE MOST ADVANCED COLLECTIONS. After an exhaustive review of numerous name auction sales in which singles and even used blocks show up with frequency, unused blocks (or even pairs) of this issue are rarely encountered. We are aware of only one larger multiple, a corner selvage block of six (ex Latto), although the block offered here is in arguably better condition and nicer appearance. 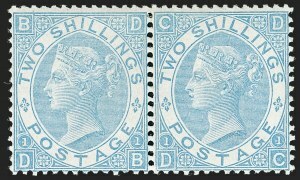 FINE HORIZONTAL PAIR OF THE 1867 2-SHILLING IN THE MILKY BLUE SHADE. AN ESPECIALLY RARE SHADE AND EXPONENTIALLY SO AS A MULTIPLE. QUITE LIKELY THE ONLY EXISTING UNUSED MULTIPLE. While larger used multiples are known, this is the only unused multiple we have been able to locate. Ex Alcock and Baillie. With 1971 B.P.A. certificate. Catalogued as singles. SG £48,000. Scott $40,000.00. FINE EXAMPLE OF THE RARE 1880 2-SHILLING BROWN. A CHALLENGING STAMP TO ACQUIRE, ESPECIALLY IN THIS PRISTINE STATE OF PRESERVATION. In 1879 the Universal Postal Union recommended establishing an international color standard for stamps in the basic UPU rates. This required changing the 2-1/2p to Blue, but that conflicted with the then-current 2sh color. Brown was selected as the replacement color, and De La Rue printed a new batch of stamps which were released in Feb. 1880. The stamps were withdrawn on July 16, 1880, creating a period of about six months when these stamps were on sale. 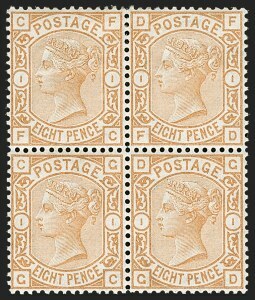 The short-lived sale period of the 2sh Brown explains its rarity, particularly in unused condition. Ex Baillie. SG £30,000. Scott $27,500.00.